Integrating the appliances behind the wood wall allowed for an uninterrupted six-metre long kitchen perimeter bench at the back of the kitchen proper – another requirement of the brief. Standing out in contrast to the matt black wall is the white Carrara marble island – the centrepiece of the kitchen. From the living area this appears as a monolithic sculptural element. 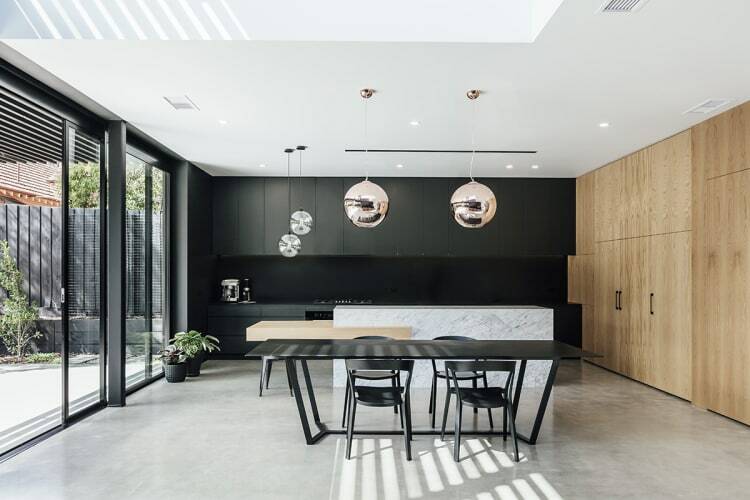 The substantial marble benchtop operates as a worksurface, while the lower, cantilevered wooden bench serves as a breakfast counter.